First I’ve to excuse that we are so selfish to call our programming model ninja-style. It was happened based on the fact, that we have programmed ninjas in internal programming course. But the term ninja-style was established and if you gave something a name, it’s very hard to change it (Maybe you have seen Monster.Inc by Pixar, then you know what I mean). Our intention is to make programming for XPages as much fun as possible. And fun means in the case of programming: Having success, with less of effort and stress. Definitely a lot of topics to cover and the most of us are not geniuses, specially universal genius. It’s a matter of fact that it is easier to split and separate the topics. Because of this we have introduced the N-Tier architecture to our programming model. We have separated the front end stuff, from the back-end stuff. The back-end guys do all the brilliant stuff with the model of the data and all the processes. Mostly they are Java Cracks or on the way to it. They care about good backend performance and have read the book “design pattern” by the gang of for. No interface and connection to any backend is to complex for them, but do not let them do any HTML stuff. But where are the storage guys? At this point, some of the core features of the XPT cames to action. The DSS of the XPT solves all the storage stuff. But keep this: Having success with XPages has to be about simplification. Our first step was to separate front end from back-end. We have released an early beta of the XPages Toolkit, called beta1 on OpenNTF. A short time before I was going to the hospital for a heart revision task :). 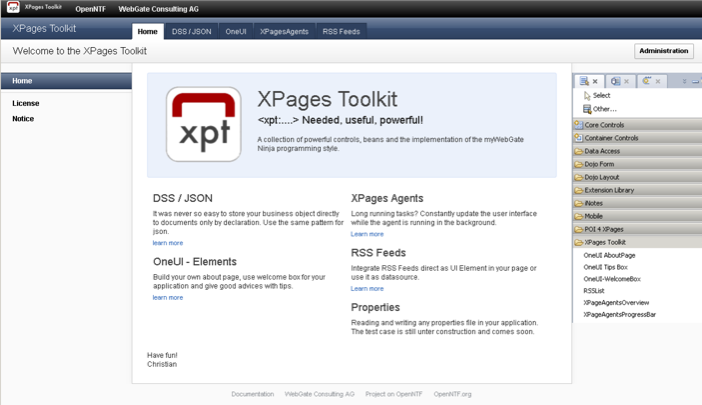 But the XPages Toolkit need some explanations about the why and what. The XPages Toolkit (in short XPT) is a extendable Extension to the XPages Runtime and the Extension Library. The XPT contains a strong core for a programming model that we have introduced at WebGate as the ninja-style. I will blog later this week about this programming model and I will also make some snippets to this available. And it is extendable. We have designed the XPT to make it easy to plugin other solutions. I will cover this topic also in a separate blog post. But in short, I think there are some many good things available under apache licence. Or think about the charting in dojox, its one of the things that I miss as a good UI Control. I know that there is a great OpenNTF project available from Julian Buss (YouAtNotes xCharting), but why not integrate the code into a plugin? PS: Heart revision task was successfully completed and I have a good recovery time.